Lord Mandelson: "I think people will want to come together"
A "nationwide celebration" will be held to mark The Queen's Diamond Jubilee, the government has announced. Events to mark The Queen's 60 years on the throne will take place in the first weekend of June 2012, with an extra bank holiday being created. Lord Mandelson said it would be a "truly historic occasion" which would allow the British people to show their "pride and affection" for The Queen. He also announced that Greenwich would become a royal borough. The Queen's Golden Jubilee in 2002 was marked by celebrations across the UK, including a royal tour and a pop concert featuring guitarist Brian May playing a God Save the Queen solo from the roof of Buckingham Palace. 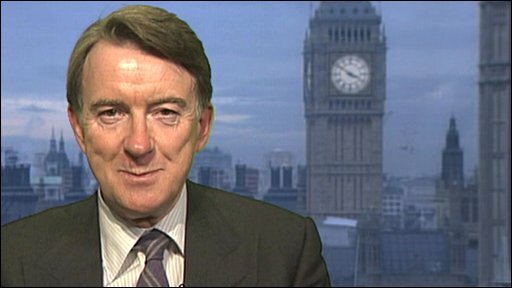 First Secretary of State Lord Mandelson told peers that a series of "fitting events" would be held in the summer to 2012 to mark the Queen's Diamond Jubilee and that planning was at an early stage. He said the government had agreed to grant an additional bank holiday on Tuesday 5 June to provide a focal point for the celebrations. In addition, the traditional Bank Holiday at the end of May will, in 2012, be moved to 4 June to make it a four day weekend. He said that although bank holidays were a devolved matter the government would "work closely" with the Scottish Government "to ensure that people across the United Kingdom can celebrate the jubilee together". Noting that Queen Victoria was the only previous British monarch to have reigned for 60 years, Lord Mandelson said 2012 would be a "landmark year". Hailing The Queen's time as sovereign as "near-perfect", Lord Mandelson said the celebrations would give the British people the opportunity to show their "great pride and affection" for the Queen and her contribution to British life. "People across the whole country will want the chance to recognise this remarkable achievement," he said. Special commemorative medals are to be issued to mark the anniversary, with recipients likely to be those who have shown "tremendous service" to the country. Lord Mandelson said he would consult on this and said he would also consider other suggestions including a special horse race - reflecting the Queen's love of equine interests - to mark the event. Queen Elizabeth II ascended to the throne in February 1952 after the death of her father, King George VI. The Diamond Jubilee weekend will take place just weeks before the start of the London Olympics with host of other events are likely to take place in the monarch's honour such as a service of thanksgiving, possibly at St Paul's Cathedral. Republic, which supports an elected head of state in the UK, said 2012 should see a "meaningful debate" on the future of the monarchy and proposals for "serious reform". "If we want an extra public holiday, aren't there better dates to choose from?" said spokesman Graham Smith. "Armistice Day would be a good start, recognising those ordinary men and women who make real sacrifices for our country."